La Purificadora Restaurant at the La Purificadora Hotel en Puebla located in Puebla, Mexico artistically incorporates contemporary and traditional design elements that complement the delectable traditional and contemporary cuisine perfectly executed with stunning results. The owners of La Purificadora Hotel en Puebla property transformed a vacant 19th century water purification plant into a visually exciting contemporary design hotel and restaurant. 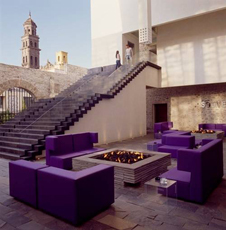 The juxtaposition of old and new architectural elements, furnishings, and art of the 26-room luxury boutique hotel which opened in May 2007, dramatically and deftly ties together the essence of historic and modern Puebla with a great big purple bow, one of the signature colors of the hotel. I stayed at La Purificadora Hotel in late October 2009, and to fully appreciate the ambience of the hotel and restaurant, I began my evening at the Terrace Bar located on the third floor where I was rewarded with striking city views. I sat on a wood stool at a tall table overlooking the long rectangular pool and the Iglesia de San Francisco, the oldest church in Puebla, built in 1535, that was illuminated and stunning against the dark velvety sky. The Terrace Bar has a very interesting cocktail menu, and I had a horchata martini, which is one of Mexico's traditional flavors. I sipped my milky sweet cocktail with a hint of cinnamon as I watched the spectacular fireworks off in the distance. 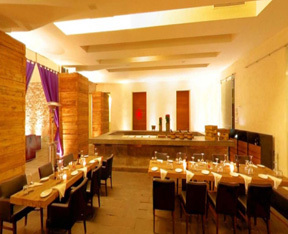 Senses awakened, I proceeded to the restaurant where I entered through one of the four archways graced with draped purple fabric to create a dramatic entrance. Sitting in a comfortable black leather armchair at an antique wood table, I had the perfect vantage point to appreciate the design elements of the restaurant including the long bar, the wood tables, the rough hewn stone floor, the wood columns, the white walls softly illuminated by votive candles, and the low background music that completed the ambience. Dinner began with a basket of rolls accompanied by a selection of red salsa, butter, and salt attractively presented in individual pots on a white rectangular tray. For my first course (entrada) I had a delectable sampling of Squash blossoms filled with cheese and served with tomato broth (Flores de calabaza rellenas de quesillo con caldillo de jitomate), Shrimp Tacos (Tacos de camaron); and Chalupitas with red sauce, duck confit, and caramelized onions (Chalupitas rojas de confit de pato y cebolla caramelizada) presented on a white teardrop shaped plate. Ever since I had my first taste of squash blossoms stuffed with cheese, lightly dusted with flour, and then quickly fried several years ago in Milan, Italy where I fell in love with their delicate texture and flavor, I have searched restaurants around the world trying to recapture my Milan experience, and although some came close, their exquisite taste and my memory of them had been left wanting. The squash blossoms at La Purificadora Restaurant happily lived up to their promise and to my Milan memory of them; the miniature shrimp tacos were another highlight, and the chalupitas, a staple of traditional Cocina Poblano (the cuisine of the Puebla region), made with small corn tortillas lightly fried and topped with red salsa, duck confit, and caramelized onions, were also well presented. This course was paired with a bottle of private label wine for La Purificadora produced by Bodega Winery, Viñas de Pijoan, Valle de Guadalupe, Mexico, 2005, 13.5% alcohol, made from 40% Cabernet and 60% Grenache which had an aromatic nose with lush dark fruit on the palate. 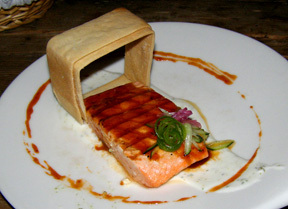 I continued with a very tasty second course (plata fuerte) of Grilled Salmon with creamy yoghurt, Manzanilla sherry, and chipolte (Salmon al grill con cremoso de yoghurt de Manzanilla y chipolte), which was attractively presented with a standing open square of brik pastry to accent the grilled salmon that was glazed with a Manzanilla sherry and chipolte sauce that had a hint of spice, on a delicious bed of yoghurt sauce, with a ring of chipolte sauce outlining the white teardrop plate. 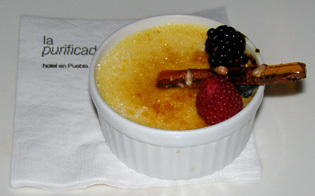 I ended the evening with a smooth and delicately creamy Pinenut Crème Brûlée (Cremme brûlée de piñon blanco), which arrived in a white pot with a perfectly crisp crown and was garnished with a large blackberry, raspberry, and a spun sugar stick. 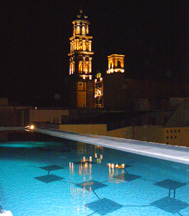 Read about La Purificadora Hotel en Puebla in the Hotels and Resorts section. 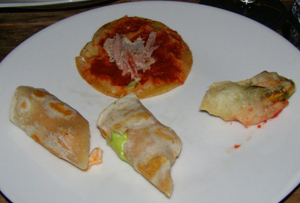 Please read other articles on Puebla, Mexico in the Destinations, Hotels and Resorts, Restaurants, Chefs' Recipes, Gastronomy, and Art sections.